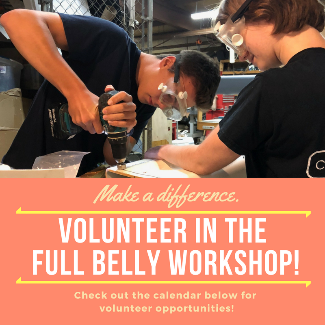 Full Belly Volunteers: Workshop Calendar! Use this calendar to sign up for your workshop volunteer hours! We have opportunities every weekend with our Saturday Volunteer Program! We also have a monthly Full Belly Clean-Up Day, where we come together to make sure our office and workshop are in a great condition to represent our cause! Other special projects or opportunities within our workshop will also show up here!